With the existing level of inequality serving as a major challenge to the growth of the Nigerian economy, there appears to be a dire need to empower women in a bid to increase their capacity, as well as boost national productivity. In line with SDGs 1, 5 and 8, ACT Foundation has partnered with Mamamoni to equip women with the skills for self-sustenance, as well as to promote inclusive growth from the grass roots. Mamamoni Nigeria has been able to train and equip over 300 low-income women in Amuwo- Odofin LGA on vocational skills that will enable them sustain themselves, their families and communities in the long term. Many of such skills range from soap-making to the manufacturing other household management products. More so, these women are given access to loans that will enabled them set up and grow their businesses immediately after their training. Furthermore, they have been introduced to the basic aspects of financial technology, and this has led to an enhancement of their financial literacy. 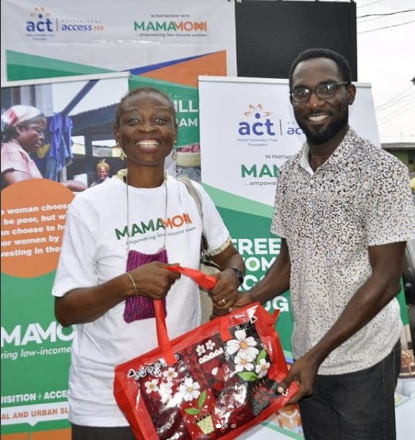 ACT Foundation CEO, Osayi Alile commended the efforts made by its 2018 grant recipient, Mamamoni towards empowering women with low or no income. “For us, Mamamoni is positioning low-income women for accelerated productivity and nation building. We are certain that in no time the level of their productivity will increase, and so will output because they have been introduced to Fintech to make things easier and safer”, Ms. Alile added. Aspire Coronation Trust (ACT) Foundation is a grant making organization established in 2016 to tackle challenges associated with development on the African continent. ACT Foundation also supports the growth of social enterprises whose objective it is to impact sustainably and positively on underserved communities towards accelerating socio-economic growth in Africa.